There is a wealth of knowledge, input, experience, and perspective just waiting for us when we are willing to listen to others. To everyone. From the guy selling us a newspaper in the morning, to the colleague at work for whom we have no patience and no time, to the three-year old child who can’t even get the words out right. Each one of these people has a view that can bring us out of our own stuck perspective and help us move along our path to where we want to go. If we’re willing to listen. The greatest leaders know they don’t have all the answers or all the great ideas. They know to listen to others for new ideas and possibilities, and they know that those ideas and possibilities can come from anywhere – from people at all levels and all walks of life. The greatest parents know that listening to their kids is one of the greatest gifts they can give – and one that also gives back in the breadth and depth of information they gather. Those people who make us feel that we are the most important person in the world to them are those who truly listen to us. By listening we give ourselves a great gift and a chance to learn and grow more. Where in your life could you listen more, or more fully? 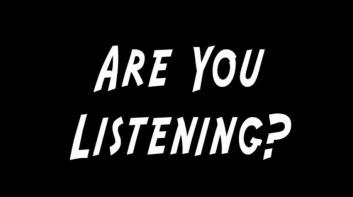 Whom don’t you listen to now, and how can you begin to listen? Pick three people whom you usually would never listen to and listen to them fully. Look for the value they have to offer.